The Gambia’s ex-ruler, Yahya Jammeh, plundered the state coffers in his final weeks in power, stealing millions of dollars and shipping out luxury vehicles by cargo plane, according to an aide to new president Adama Barrow. Jammeh, who ruled the small West African country for 22 years, flew into exile late on Saturday to Equatorial Guinea. He had refused to concede defeat in a December 1 election but eventually relinquished power after a delegation of West African leaders convinced him to step down, even as troops from neighbouring countries entered The Gambia. On Sunday, hundreds of Banjul residents cheered a military force by ECOWAS, the West African regional bloc, as it entered the capital to provide security and allow Barrow, who has been in neighbouring Senegal for more than a week, to return and take power. But amid growing controversy over the assurances offered to Jammeh to guarantee his departure, Barrow adviser Mai Fatty said the new administration had discovered that millions of dollars had recently been stolen. “The coffers are largely empty,” he told reporters in the Senegalese capital, Dakar. 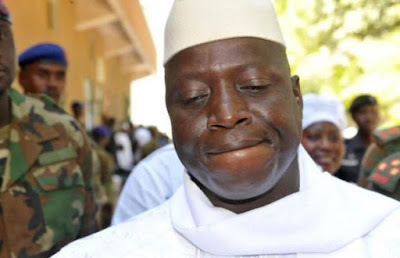 Fatty also said that a Chadian cargo plane had transported luxury goods out of the country on Jammeh’s behalf, in his final hours in power, including an unknown number of vehicles.